Hi everybody, before we start anything! congrats to the TLMC#12 finalists! 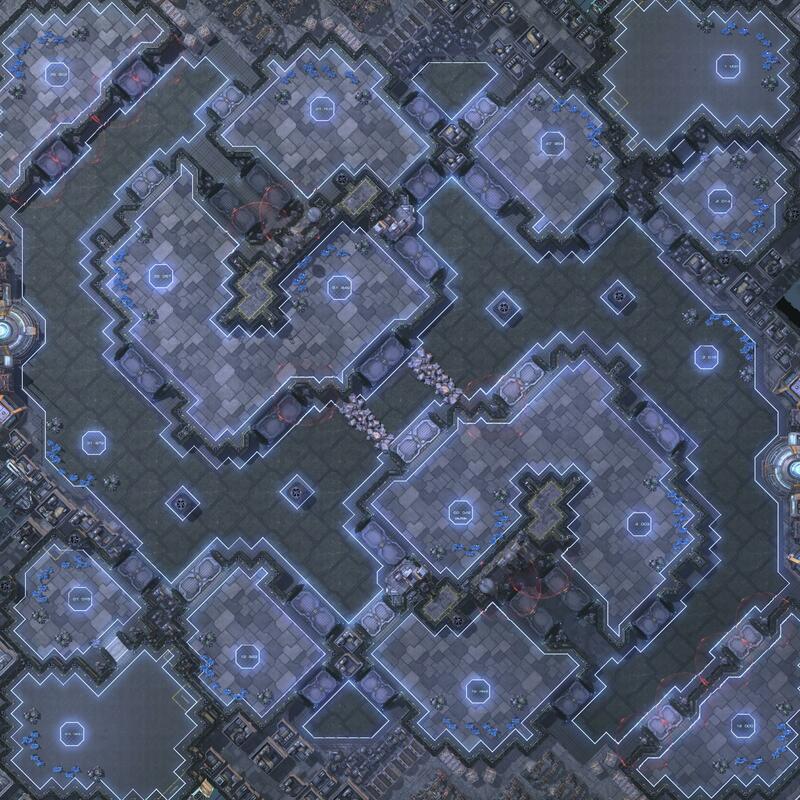 This thread is mostly dedicated to those that didn't made it to the finals to ask questions about their maps. Tho to those inpatient souls it is very much recommended to first check out previous "Mapping Guidelines" and the TLMC8, 9 & 10 feedback threads before you submit your questions, as I don't have much time and I have to use it where counts. As an extra note there is my youtube channel where I have been uploading Mapmaking feedback videos for finalists and non-finalists alike, it is highly recommended for y'all to peruse around! If you would like to receive feedback on your map, post the name of your map, the overview and any specific questions you might have, as a further restrictions, I will only be able to give feedback to 2 maps per person, sadly time is ever more scarce, but I'll try to get to as many of you as possible. There might be videos this time around, there might not! No promises, only hopes and dreams. And in the same fashion, other judges might also join, or might not, it depends on their own personal timeframes. And this way, we begin! 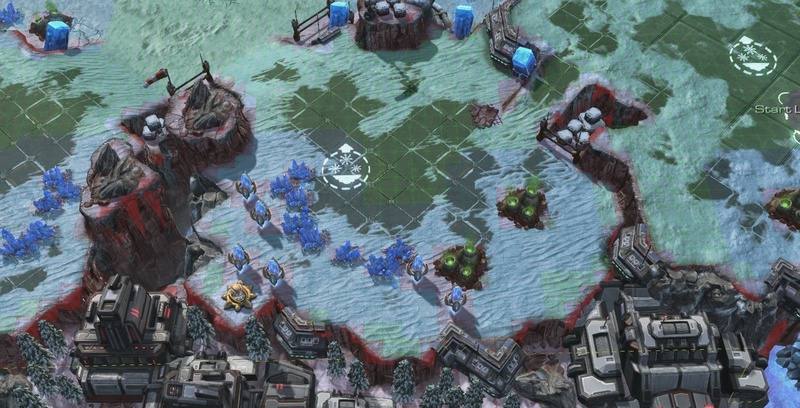 -Was this map exactly leaning towards more turtle play, due to the limited paths into the multiple amount of bases? 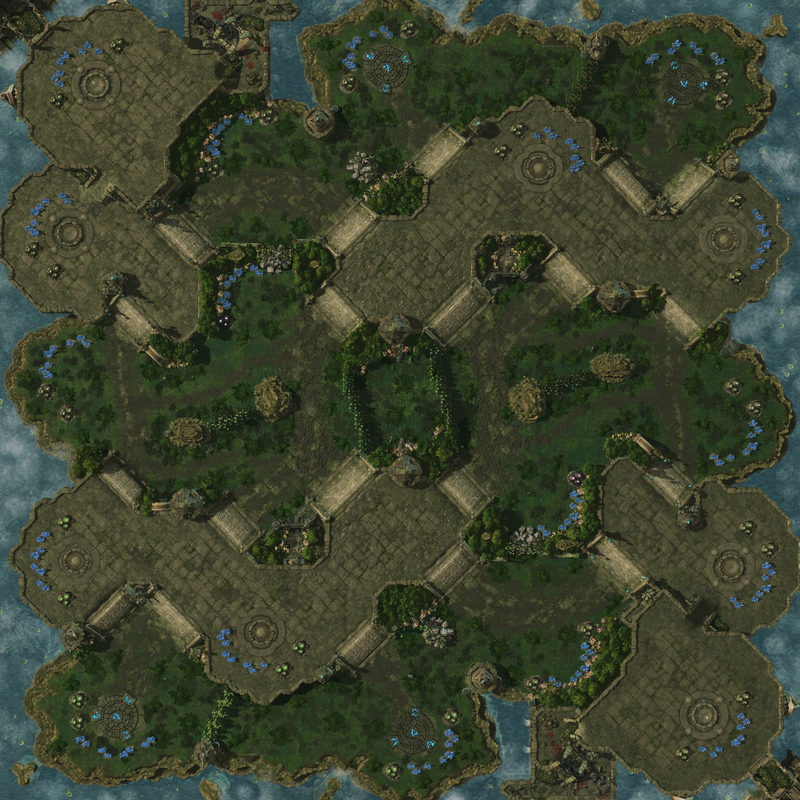 -Was this map more of a 'standard map' over macro map due to design/limiting center? I would ask 2 questions but these two will generally help me with macro map design. If I end up asking a general question, give me a single factor to the answer and I'm likely will be able to piece it together. Just looking for all the feedbacksies! Hoping to compete in TLMC 13 whenever that comes around and I'd love to get as much as I can from my submission in terms of feedback. EDIT: Missed the note on specific feedback during the first read. How would I go about making the base layout less awkward? If I recall correctly you said in the Discord some stuff about it but was too tired to go in depth. Why not because I'm curious! I'm sorry for adding to already long waiting queue. In fact, Kantu gave me lots of nice feedbacks already along with AVEX so this time I also want to get comments from other judges too. Especially those player aspects. Or at least their thoughts during judging period. Looking to see the biggest problem areas. I spent ages on the aesthetic, like (4 weekends!,) so I'm hopeful I could work some feedback in and resubmit it. Indeed, the map is considerably turtly, specially so because of the very, very short distances between bases and the relative ease of securing nearby bases once a third has already been secured. 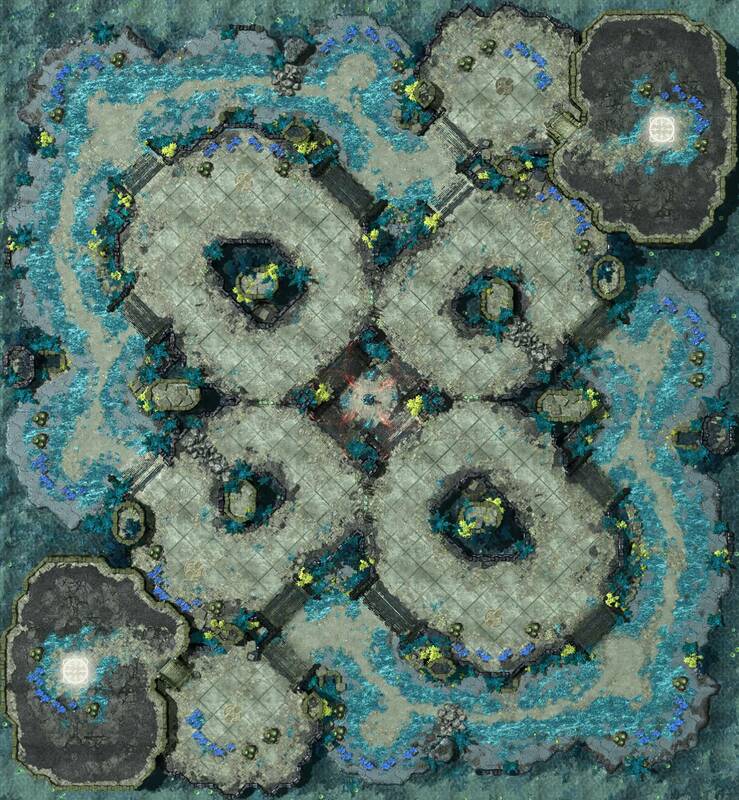 Now, given the overall openness of the lowground in front of the natural, I dont think that's too much a problem, and other judges gave the map a "medium" set of ratings, so it can be agreed that it isnt "god awful" or anything of the sort, yet because of said openness and lack of distinct map features it would certainty benefit Z maybe overly so. I would indeed recommend you to see what Gemini would ask of it, Tweet at him telling him Im interested on his perspectives about it, that should suffice. And hopefully Avex might be able to chime in aswell. 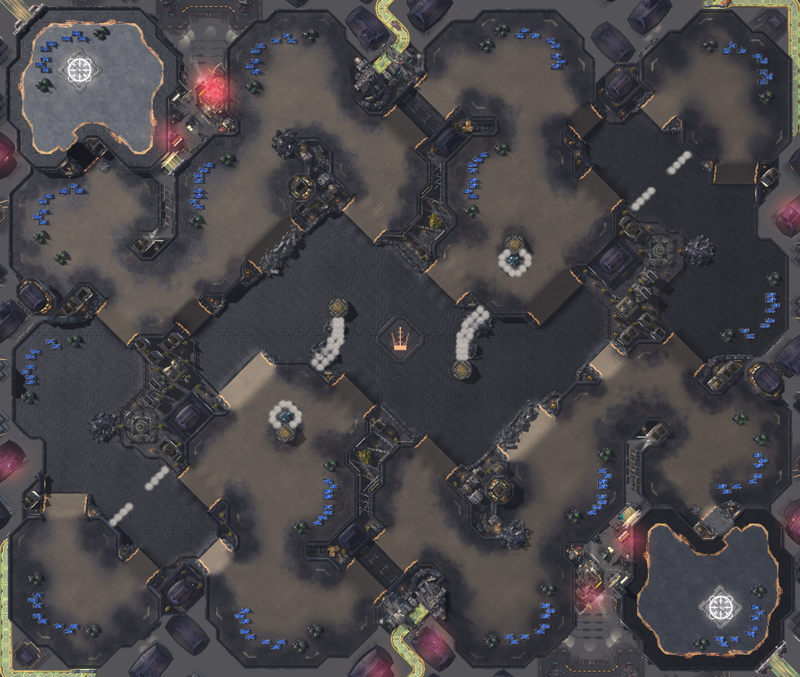 Also, the map's natural was simply *choke-full* of cannon rush spots, and when it came to my personal rating, that certainty played a role on the rating I gave it. It is simply not good to have those kind of situations where you end up creating situations that provide false choices to players, in this case players might easily think that they can walloff with help of the rocks, when that's simply not the case, in further maps be sure that the rocks you use are 6x6 or that at least allow for walling of the ramp. When it comes to the question itself, yeah, I would indeed say that the map falls within the spectrum of macro, because of the rather safe third base and the constricted center of the map. That said, the very center of it I find it overly restrictive when it comes to actually being able to create more interesting army movement through it. 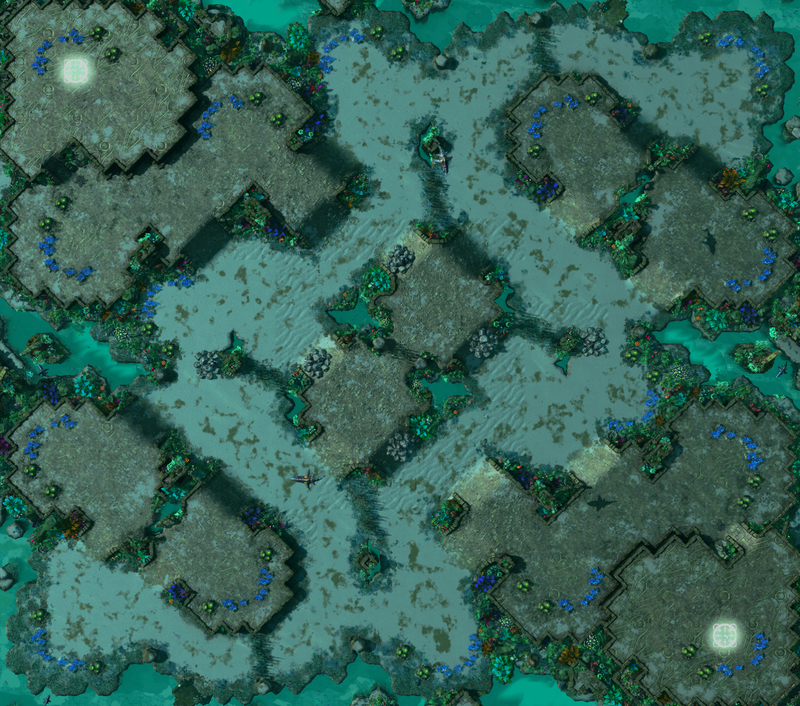 The biggest issue continues to be the area in front of the third base, given that said unpathable area is too big for the intended gameplay outcomes of creating two main central attack paths, besides that issue there is the case that the wings of the map simply arent compelling, and the biggest reflection of that are the rocks placed in the bush of line of sight blockers. The central pathways at their core bring problems of armies attacking up the central highground and becoming overly hard to flank, that can be very much a problem with ranged siege units. So even when the distance between the lowground third base and the central highground is enough to ward off the direct problems caused by potential siegetanks attacking from the highground, it isnt enough to ward off against the gameplay staleness that can come from said situations. 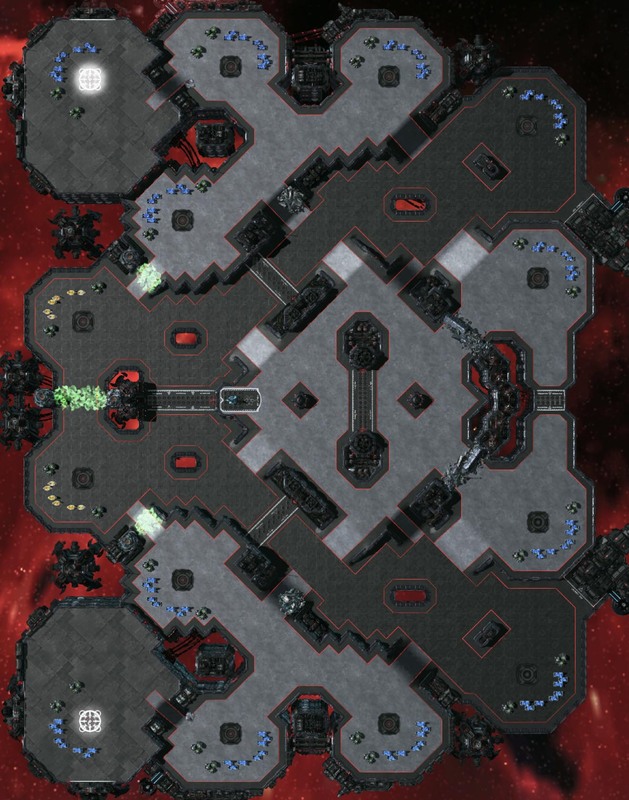 Generally overlord pods such as that one are placed on the opposite side of the main ramp, in order to assure that there are no false choices in the map which cause frustration all around, in this case in particular, I dont consider it to be a highly egregious situation because of the size of the overlord pod which allows Zerg players to move the overlord slightly farther away of the main ramp and units in the highground, yet that's still not really ideal, and there's no strong reason why the overlord pod couldnt be on the other side, maybe smaller in size aswell, that way reducing potential player frustration. As a detail, I would recommend you to add more doodads to the unpathable highgrounds/overlord pods, in order to assure that players can instantly recognize those as being unpathable. 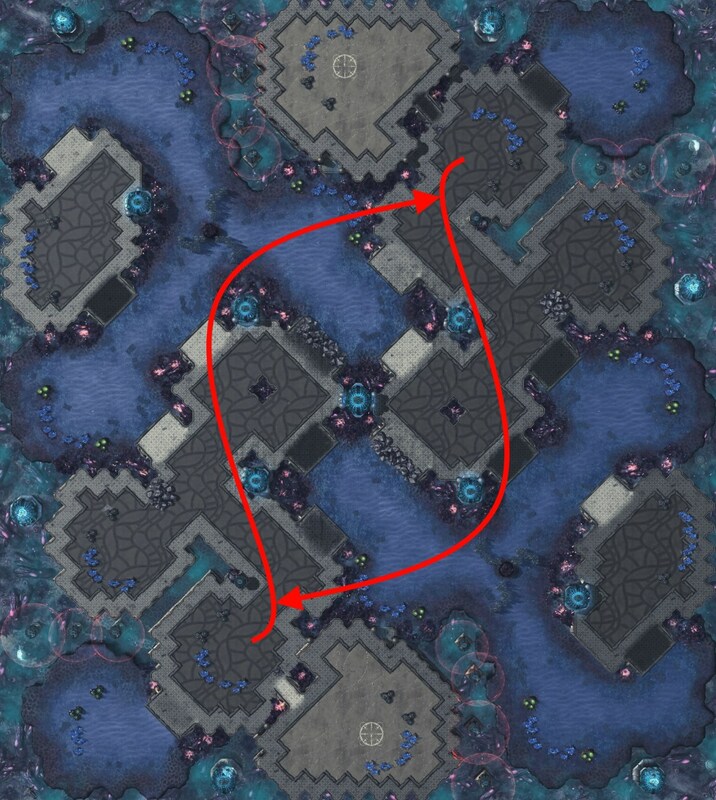 As it stands the doodad usage with the purple craters, because you are using said craters in other pathable areas of the map from my perspective doesnt communicate enough that said highgrounds arent pathable. 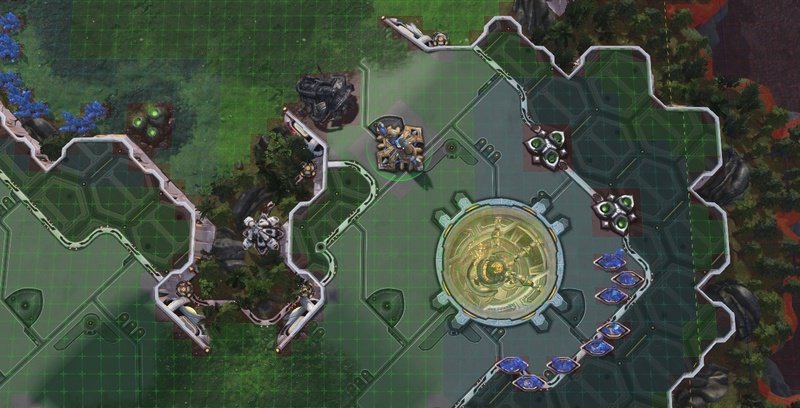 Map has got a dangerous cannon rush spot behing the mineral line, and a less problematic one by the main base ramp, which probably should still be taken care of given that's a 2 pylon cannon rush. 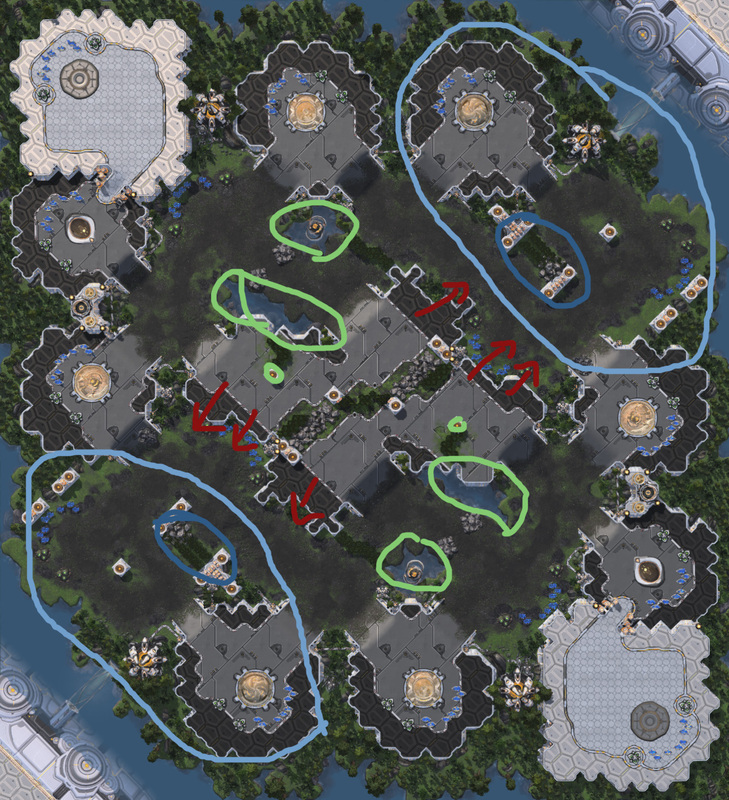 In green, I highlighted the areas which I consider to be problematic, in red, a mineral line which should have been a "cardinal" mineral line tucked against the edge of the map instead, and in purple the corner ramps, which are just not overall well placed as they are highly redundant. In such an scenario many times it is simply better to not have corners at all and leave that space for pretty aesthetics. What I would recommend before proceeding further is to try and regain more playable area from unpathable areas, cliffing and doodads, then see how you can use that extra space to further accent the map, or create more battle areas or highly strategical spots. And ofc be sure to post in to the #WIP maps channel in discord! Is there any possible issues with layout and flow of the map? 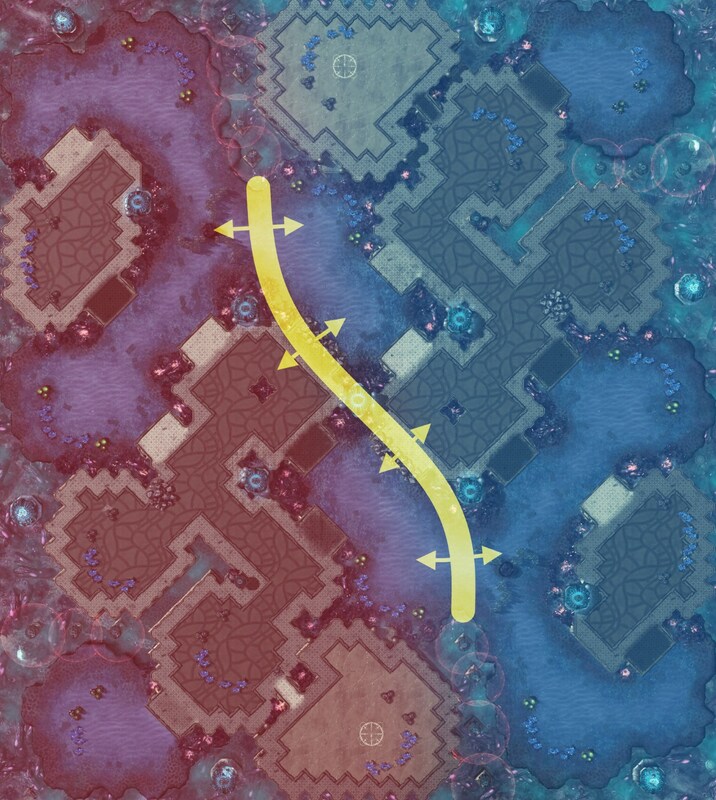 Are “chokes” reasonably sized or are they too wide and make paths too monotonous and corridor like? Also how you view the LOS blocker usage on map? 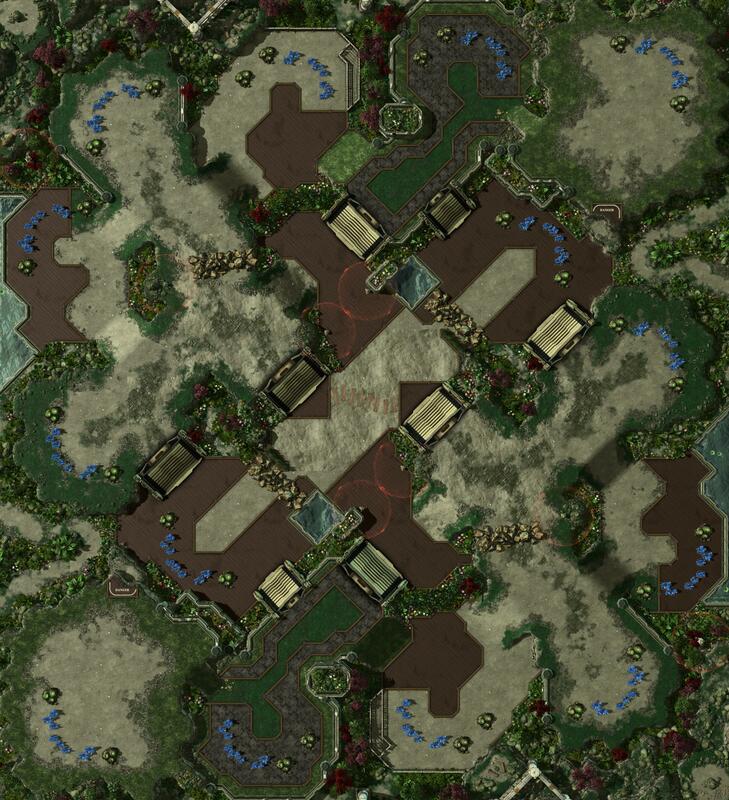 As newer map maker I don't really know what to polish. Polish only texturing, decoration and on smaller scale pathing or address bigger issues not yet mentioned? Thanks for the feedback Kantuva. And easy from what I can pick together from the feedback, I have work to do for macro. But that is no surprise. 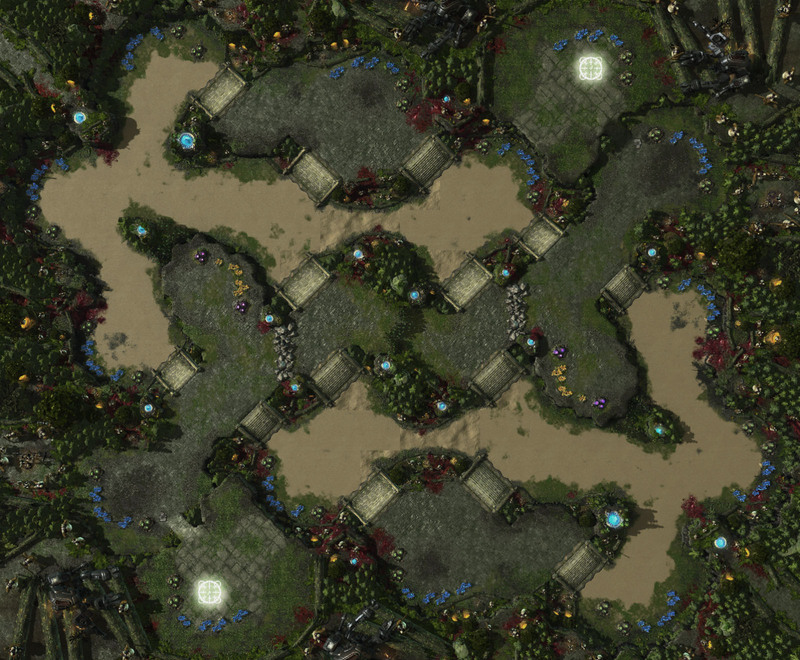 Choke full of cannon rush spots is a understandable factor for one maps problems. 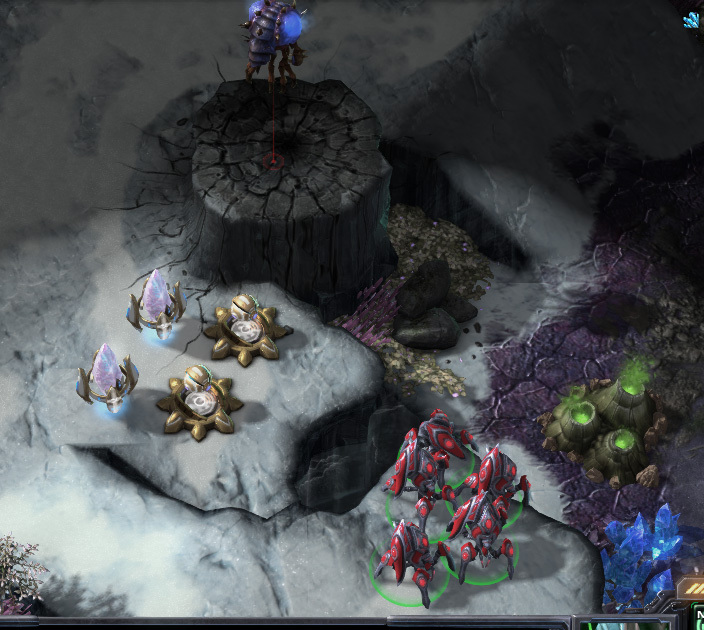 Besides openness that favors zerg and nothing as appealing, and Nye reg problems that I could of stopped if I considered redesigning and removing of some if not 90% of debris/rocks. Again thank you, with that I can start to improve my macro general design. And possible fix Nye Reg! - How much impact did the base count have? 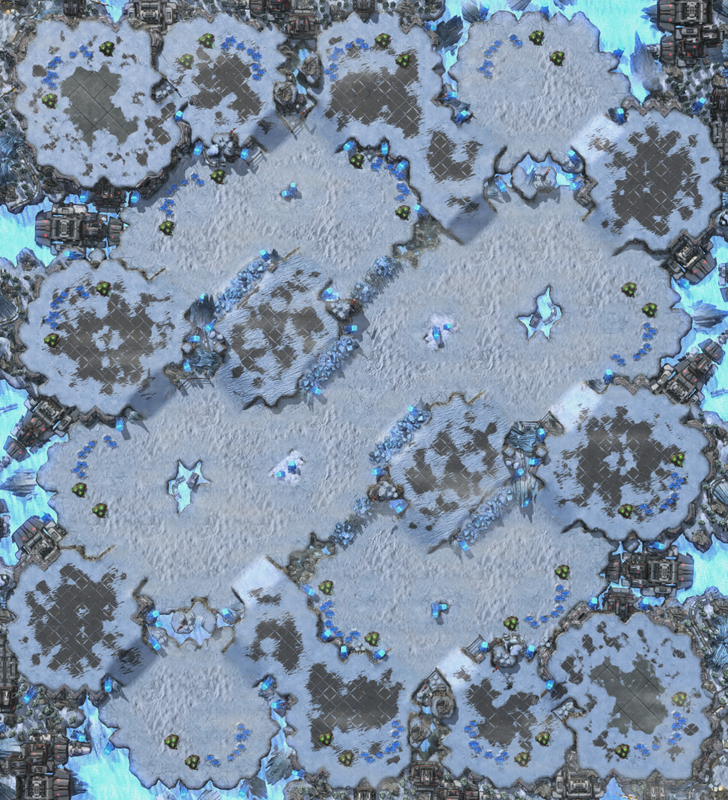 There's only 14 bases on the map but I don’t think I could really fit any more in. 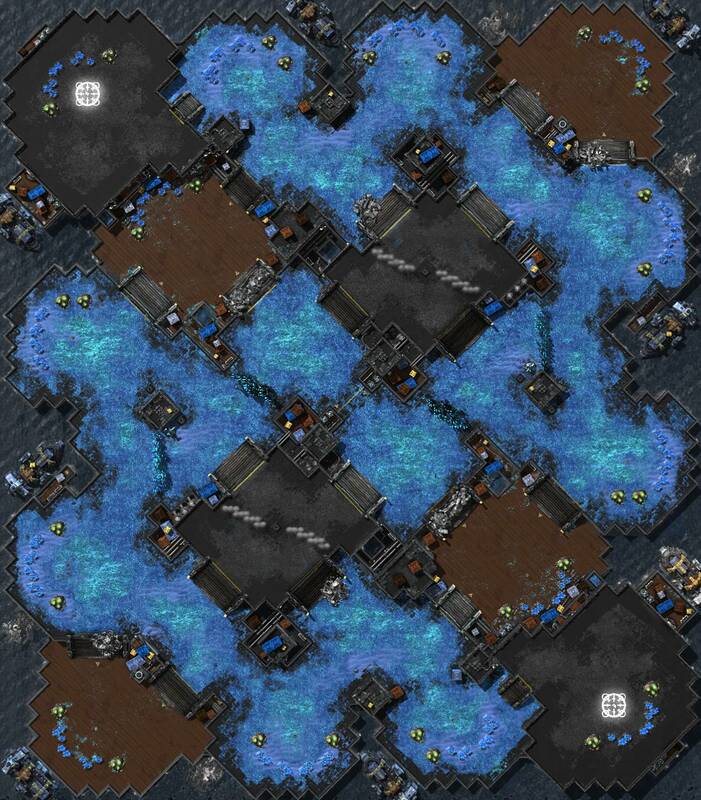 In the pre-judging feedback there were some concerns about having only 14 bases for a macro map, so do you feel that I should try to keep this macro or would it be better to have it as standard, and if so, should some things be changed in order to make it more standard or would it be ok as it is? 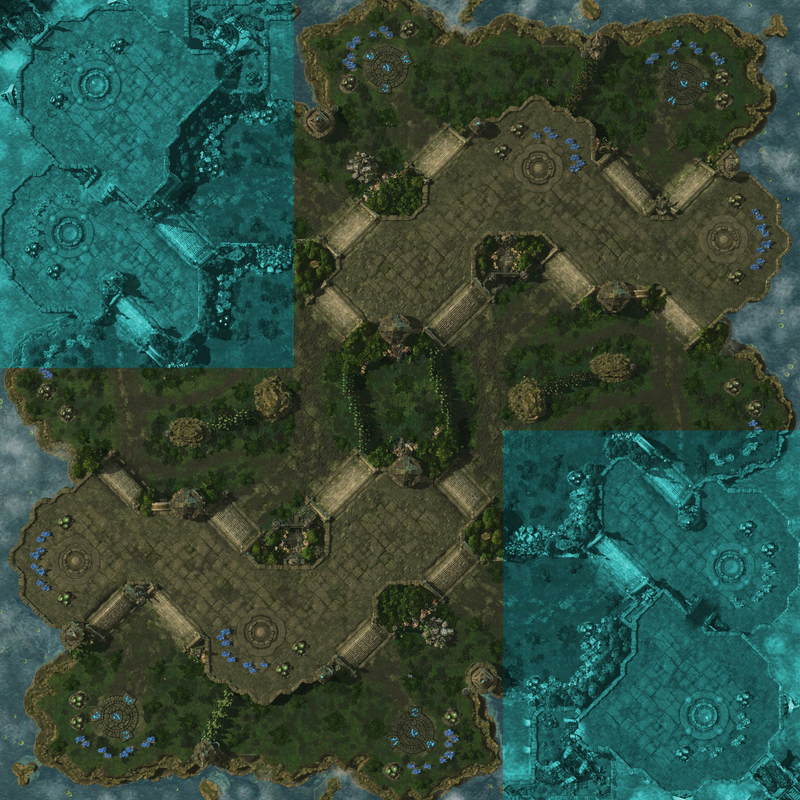 What I would be concerned with is that it would be too large for a standard map as it is 154x136 in size. -If I were to keep it as macro, are the thirds still too open? I guess the lowground third could be made a bit safer to take than what it is now. I did make the choke at the highground triangle narrower already after the initial feedback. Apart from making the thirds safer, are there some other ways to make it more macro? -And lastly, have I overlooked any other issues that should be fixed?